Shopping for gifts is one of my favorite holiday activities. Aside from my wonderful family, I like to bring a little something to whoever is hosting a party or gathering I’m attending, and I enjoy giving my friends and neighbors a treat, too. Thankfully, there’s a lot of great shopping in Minneapolis Northwest, and I’m always able to find fun gifts within my budget. The Shoppes at Arbor Lakes is a wonderful option since it has every kind of store you can think of, from clothes and jewelry to sporting goods and home décor, and from thrift stores to high-end retail boutiques. World Market is a perfect spot for finding unique and fun host/hostess gifts, and Trader Joe’s has excellent, affordable wines. I can easily take a day and get most, if not all, of my shopping done at the Shoppes. Albertville Premium Outlets, about ten minutes north of Minneapolis Northwest, has tempting deals that are hard to pass up, so I do like to make a stop here at least once during the winter, and the deals continue after the holidays, too. In fact, one of the best days to shop is the day after Christmas, when shoppers can get half-off on a number of items. It’s a good time to get those nice slippers you wanted or a beauty and makeup set – something to treat yourself. Born and raised in Minnesota, I grew up ice skating and playing hockey with my family, and it’s a tradition I’ve passed on to my kids. The Central Park Ice Loop is simply too much fun to miss. It’s so much more interesting than skating around a traditional rink where you tend to skate in a large circle. 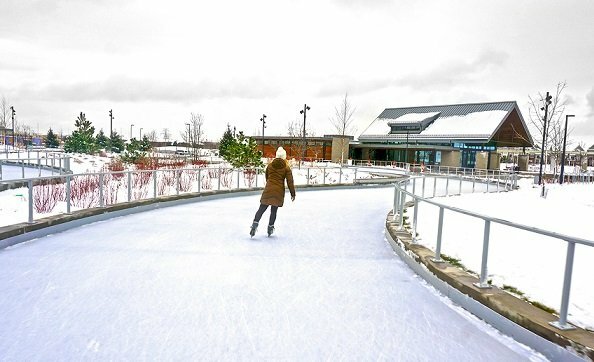 Instead, the ice loop is an 800-foot winding trail with trees and landscaping decorating the area. Even skating at night has a romantic charm to it, as you glide through the trees and lights. A Zamboni runs over the ice every hour, so the ice is always smooth and ready for skating. When a game of hockey is in order, my two sons will either clear a patch of ice on a river or lake, or we’ll head to a Wild game at the Xcel Energy Center. We like going to a game as a family a couple times each year. The crowds and the energy in the building are incredible, and the caliber of competition makes it an exciting event. 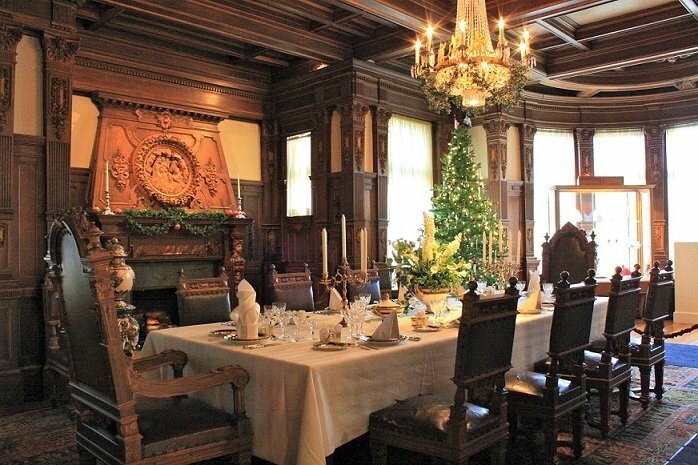 One of my absolute favorite places to visit this time of year is the American Swedish Institute. It’s a museum celebrating Nordic heritage that’s located within a gorgeous, stately mansion. During the holidays, it’s decorated beautifully against the dark mahogany of the banisters and staircases, and old-time family portraits hang on the walls. It feels like something out of a time capsule! There’s a delicious bakery, and it’s a pleasure to taste the festive baked goods, and a gift shop that’s perfect to browse for holiday gifts. There are often events and programs going on at the museum, but I like to drop in and wander around. I specifically like visiting the museum’s café, FIKA – which means a Swedish coffee break. The dishes are authentic, and my favorite is probably the meatballs with lingonberry and mustard sauce. The environment is so festive that it’s impossible not to get swept up in the spirit of the season! My family is very active with winter sports. We enjoy being cozy inside but the weather really doesn’t stop us from bundling up and taking in the fresh air. After all, there’s no such thing as “too cold” if you’re dressed correctly! When the snow hits, my husband, daughter and sons love going to Elm Creek Park Reserve. It literally has everything we need to have a good time outdoors. We can rent skis or snowshoes and enjoy the pretty winter landscape, and my boys will spend hours snowboarding and taking on the various hills. Night skiing is extra exciting when the trails are lit up and the stars are out. 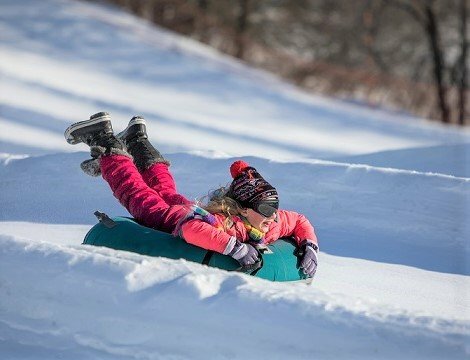 The tubing hill is popular in our family – there are so many different chutes to sail down and the moving sidewalk makes it easy to get back up to the top quickly. And if we need to warm up or need a rest, we pop into the Elm Creek Chalet. There’s a large fire and hot chocolate available to enjoy! The holiday season is my favorite time of year to see a show. 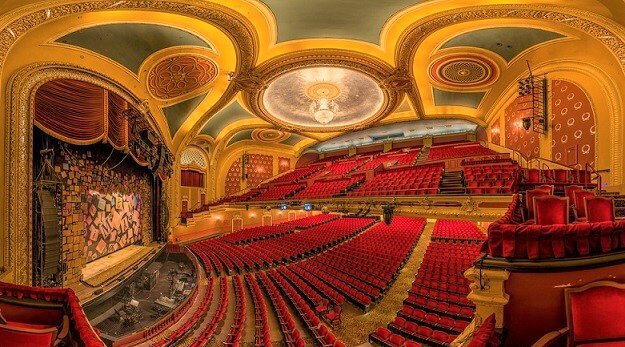 With so many shows for families, like A Christmas Carol at the Guthrie Theater and Dr. Seuss’ How the Grinch Stole Christmas at Children’s Theatre Company, there’s a show out there for everyone. I particularly like getting dressed up for a night on the town with my husband to take in one of the big theaters downtown for a special evening. This year we’re looking forward to seeing Les Misérables at the Orpheum Theatre. Before the show, we’ll go out for a nice dinner and drinks at either Pittsburgh Blue or Rodizio Grill, since they’re a little more upscale than the places I frequent when I have my kids in tow. Pittsburgh Blue is very cozy with its dark wood, deep red décor and the fires blazing away. It also has a great happy hour! 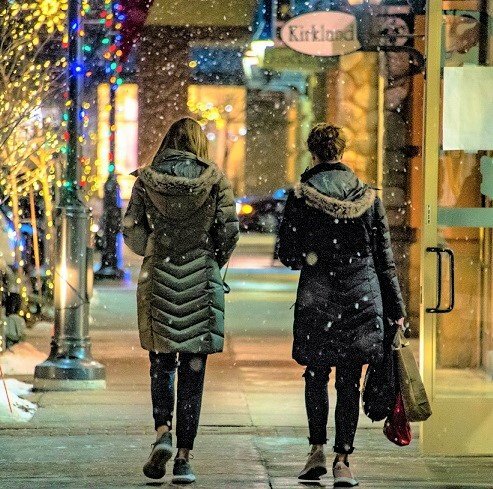 There are so many ways to enjoy winter and celebrate the holidays in Minneapolis Northwest, and I’m thankful to be in an area that offers so much! Check out a few of our other blogs for our top holiday shopping favorites, holiday date ideas and top picks for indoor fun! Share your winter adventures with us on Facebook, Twitter and Instagram using the hashtag #WeLoveMNW, and you may be featured on our website!